In keeping with our overall philosophy, Asocacioñ Tierra works on many fronts to conserve and improve the local environment, always in consultation with the local communities. We hope we are also contributing to resolving major global problems such as deforestion, contamination of water supplies and climate change. There is no doubt environmental degradation agravates poverty and ill health, particularly in the rural areas of La Concha. And it forms a vicious circle as poor people, for example, have no option but to cut down trees to cook their rice and beans. So we work hard both out there in the communities to cleanse, restore, plant, educate, offer practical help….as well as on our own land. We are now deliberately purchasing land in order to save it from the chainsaw……..read on for more detail! Our vegetable patch is small but beautiful and is now not only productive but a lovely place to work and relax! We grow vegetables and fruit suitable to our climate and local soil conditions (such as lots of lettuce, eggplant, tomatoes, kale, herbs, citrics, avocados) and treat them with organic fertilizers. We use pesticides (of any sort) very rarely preferring not to kill wildlife but offering instead attractive alternative food supplies. Occasionally we just have to share!! The wheat and bananas are just for the birds and bees! We have constructed a simple water collection system of tubes and barrels. We also keep water use to a minimum by using raised beds enclosed with recycled bottles, planks of wood, even discarded plastic pipes (above far right)- anything which functions to retain water and nutrients. We then apply a mulch of straw which further acts to retain moisture. We also use banana leaves to protect recently planted seeds from the midday sun. Recycled tyres make a great mint container. The middle left photo shows lettuce seeds – now we can collect our own! Combining water conservation with maximising local employment, we water by hand. All of our organic kitchen and garden waste is composted and we also have a worm project which produces additional fertilizer. We respond to requests for help with reforesting – both public spaces such as schools and people who wish to plant a few forest trees in their backyards. The eco cookers which we donate to the poorest families and those most dependent on firewood, are a great success reducing firewood consumption by around 60%. Equally important, they help reduce respiratory problems for the (mostly) women who do the cooking. A much healthier option than open fires in the kitchen. We show families how to use them effectively and do follow up visits to resolve any difficulties. below, eco cooker donation day and its successful use. Many of our projects also have an educational component – a class on the importance of trees explains biodiversity and the connection between the disappearance of forests and increasing global temperatues. Nicaraguans are already becoming accustomed to hotter and drier weather and are making the connnections with smaller harvests and more plant diseases. The children contribute their own ideas on the importance of shade and fruit trees! Provision of clean drinking water is a problem in many of the poorer communities where we work, obviously leading to a whole range of health issues. We help out where we can by funding and building latrines, helping to lay water pipes and constantly encouraging planting of trees. The latrine below is built from sustainable, locally sourced materials. In the other photo, Asocacion Tierra volunteers are working with local people to lay water pipes to a community with no previous access to potable water. We respond to requests from individual families – Don Pablo´s house, for example, is very remote and has no access to water so we have donated barrels to help store rain water. This is by far our biggest and possibly most important project, we are currently buying over 140 acres of land in order to ensure its conservation and improvment. It is located in an isolated and impoverished community, Palo Solo. None of the families here have running water and all collect rainwater when there is any. On average, 25% of their income is spent buying and transporting drinking water. Respiratory illnesses and skin problems are very common due to the fact that gases from the volcano pass over frequently. Removal of nearly all of the forest cover means there is no protection from high winds and gases from the Masaya Volcano. Protection of the tiny bit of remaining wooded land is therefore vital. Of the land we are buying, over half is original forest and the remainder is being reforested. The surrounding area is fast becoming a monoculture desert. The ever increasing popularity of exotic fruits in the US and Europe has led to clear cut logging across our municipality. Mostly pineapple and dragonfruit – both of which like pure sunshine, absolutely no trees. The massive deforestation is having a negative impact on soil through erosion and the local natural water supply – several local springs have dried up over the past decade. Also worrying is the disappearance of local biodiversity and destruction of habitat for animals and birds including migrants, none of which is beneficial for the well being of the local human population. 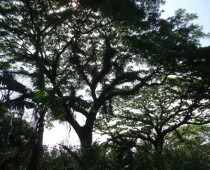 The good news is that at Cañada Honda there is still abundant tree cover including rare nisperal and ceibo trees (photo below left). This land has not been used for coffee production (common in this area) or any other crop with the result that much of the undergrowth still remains, ideal for wildlife. There are a few acres of open land where native wild flowers are growing in abundance. And we are doing a massive reforesting project – consulting with the local community, we know which are the native trees and where exactly to plant them (though there are inevitably mistakes and we learn from them!). The gases from the Masaya Volcano which impact tree gowth as well as human lungs also have to be taken into account! Above right the photo shows a cutting returning to life after just a few weeks. Below is one of the watering holes we have installed to help wild aniamls through the dry season. Flocks of parakeets visit Cañada Honda in the early morning to feed – in December 2015 an offical bird count counted 45 species of birds including warblers, hawks, hummingbirds and chalalacas (wild chickens, previously hunted for food). An ocelot was recently spotted. There are also howler monkeys living close by – they will be able to expand their territory safely. Other animals include armadillos, racoons, guatusas (long legged guinea pigs), foxes and possums. This land forms a vital part of a biological corridor, linking still forested land on the Pacific side of the Sierras to the Masaya Volcano National Park, allowing animals and birds to move naturally through their habitat, thus helping their chances of survival. Our rescued horses graze on part of this land. They have a specially built corral and their own rancho for rainy days! Meet Pepper, over 20 years old, she used to pull carts but now lives in complete and deserved retirement. We release appropriate wildlife on the land including monkeys, sloths, deer, cats and birds. This land, about 10 acres, was also purchased for the purchose of saving its trees and wildlife from developers. In a more urban area, the challenges of conservation are very different. But in a short time we have planted thousands of trees, and cared for the existing ones by, for example, building retaining walls from volcanic rock. We have installed frog ponds in all of the grounds where we work – they immediatly attract various species including the stunning red eyed tree frog. Please note hands must be wet to hold a frog! Several bird feeding/watering stations have been established and we reintroduced the native species of bees – below center you can see a bunch of bananas, favourite food of squirrels, racoons, possums as well as birds and a container for water and seeds. We have also planted butterfly gardens, including many heliconia beloved by the blue morph and a garden of medicinal plants (that is aloe vera in the recycled tyre) which can be utilized by the local communities where there is still a great deal of knowledge of traditional health remedies. The eco cooker project is based here and we use it for community meetings and education on relevant themes – the environment, natural health, organic farming are just some examples. Our vetinary brigades perform neutering and offer other services here (see Animal section for more detail). La Reserva is the site of our eco built cabin, a beautiful structure made from straw (saved from the rice harvest), then covered in adobe (mud, straw and manure) with the traditional roof tiles leaving ventilation gaps doing away with any need for air conditioning. Power and hot water are solar generated. We rent this out to people studying Spanish at La Mariposa.